For the top, at first I used MDF and cut it to size with about a 1″ overhang. I used a jigsaw to cut around the tile and it looked pretty good. 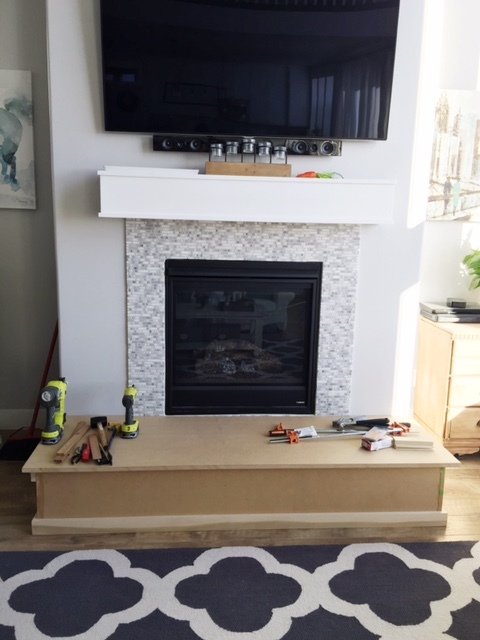 But after talking to my husband for awhile about it, we opted to take this hearth top off and order quartz for the top. It’s expensive, but this is what is going to make it look really professional and long lasting. The quartz is the same as we have in our kitchen (Hanstone Tranquility) and I ordered it from the same company. They had a remnant in their quarry which made it cheaper. They came out to my house and did a template for it so they get the exact measurements and everything and it’s going to look great, I think. However it’s not going to be installed until the week of March 21st so we have to wait until then.